Fancy a bit of good ol’-fashioned sleuthing tonight? 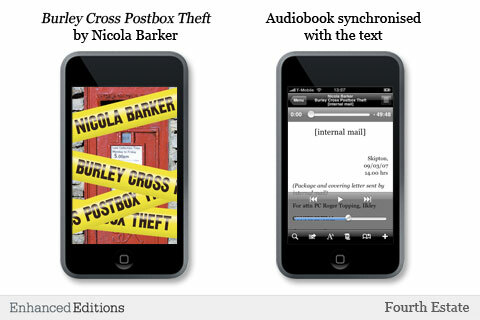 Well put on some tea, and fire up your iPhone or iPod Touch for Nicola Barker’s original work, Burley Cross Postbox Theft (released by HarperCollinsPubliers/Enhanced Medicines). Within it, two West Yorkshire policemen have to go through 26 undelivered letters and a handful of colorful characters to get down to the truth of quaint Burley Cross’s stolen postbox–but first, Sergeant Laurence Everill has to convince schoolmate PC Roger Topping to take the darned case. Told mostly through letters or correspondence–a rarity in this day of email and texting–we are welcomed into the private lives and thoughts of the citizens of Burley Cross (although some should probably remain that way, after reading). The app is designed for full reading pleasure, and holds many features that one would find useful for reading on such a tiny screen. Under the Settings tab on the bottom toolbar, you can toggle the Dark Interface, which inverts the normal white-background/black-text standard, and change font settings (size, justification) to lessen eye strain. Another option you have is to choose the type of Tilt Scrolling you prefer: Dynamic Speed or Fixed Speed. This is exactly what it sounds like; as Enhanced Editions puts book chapters all on one page, you can use the accelerometer to scroll (tip: tilt scrolling shouldn’t be used in conjunction with audiobook mode). In the table of contents, tap on a letter number to choose that “chapter.” Tapping on the screen will bring up the toolbars. On the bottom toolbar, you can Search the entire book, Share a section by email, change the font size, turn Tilt Scrolling on/off, and Bookmark as many sections as you want by tapping the + button. At the beginning and ends of each chapter are arrows that will take you directly to the previous or next chapters, bypassing the table of contents entirely. Or you can tap on the icon in the middle of the arrows to go back to the table of contents. All book screens are viewable in landscape orientation and can be locked, but not the menu screens. If you want to know more about the book or the author, just tap on the News tab on the main screens (you will need to have an internet connection to load any new pieces). As a book, Burley Cross Postbox Theft is full of quirk and charm and a slight madness. If you like your mysteries stoic and serious, you’d probably want to stay away from this novel. I highly recommend listening to the audiobook version for at least a chapter (tap the audio icon on the top right while on a chapter)…the readers have accents (unless of course you are European), which I am charmed by. As an app designed as a book, it is rather fantastic: all the options provided make for a pleasant, enjoyable reading experience. I still personally advocate print over digital, but this app really is well-designed. The only downside is the huge $16.99 price tag associated with the download. Digital books are rarely that expensive, and unless you know you’re going to want to read the whole thing, you should probably try the Lite version with the first 10 chapters for free first. AppSafari review of Burley Cross Postbox Theft was written by Julie Guan on June 2nd, 2010 and categorized under App Store, Books, Reading. Page viewed 3888 times, 1 so far today. Need help on using these apps? Please read the Help Page.